Red Earth, known as Warzard (ウォーザード, Wōzādo?) in Japan, is a 1996 fantasy-themed head-to-head fighting game released by Capcom as a coin-operated arcade game. It was the first game for Capcom's CP System III hardware, the same hardware which the later Street Fighter III games ran on. 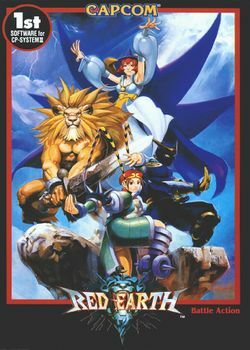 Red Earth is the only CPS III video game which has never been officially ported to home platforms, although its characters have appeared in later Capcom games. Red Earth and other games that used the CPS-3 hardware were very advanced both graphically and from a gameplay standpoint, but were not accepted very well by arcade operators due to the high price and fragility of the hardware. Despite being quite common in Japan, it was only minimally distributed overseas. Some of the characters have appeared in other games including Capcom Fighting Evolution (Leo, Kenji, Hauzer and Hydron), SVC Chaos: SNK vs. Capcom and Pocket Fighter (Tessa in both plus cameo appearances, notably Hauzer in Ryu's ending). More often than not however the characters are commonly mistaken for being from the Darkstalkers game series, also by Capcom. There are four selectable characters and eight computer-controlled opponents; and two game modes, Quest and Versus. In Quest Mode, the player chooses one of the four main characters, and progresses through a story while battling the various boss characters and gaining experience. In Versus Mode, two players fight against each other, but they can only choose from the four main characters. The character is able to "learn" special attacks and gain new equipment depending on the skill level that has been reached. Start screen for the Japanese version, Warzard. Red Earth upright arcade cabinet. This page was last edited on 19 May 2009, at 17:44.